50+ World > History & Headlines > 1952 > What Was New in January 1952? Director and producer Cecil B. DeMille's epic Ringling Bros. and Barnum & Bailey Circus movie The Greatest Show on Earth premiered in January 1952. Starring Betty Hutton, Cornel Wilde, James Stewart (always in makeup as a clown), and Dorothy Lamour as circus artists and Charlton Heston as circus manager, The Greatest Show on Earth was a box office smash in 1952. It's critical acclaim was mixed, but The Greatest Show on Earth won the Academy Award for Best Picture (beating The Quiet Man, Singin' in the Rain, and High Noon). Below, the Paramount trailer for The Greatest Show on Earth, with an introduction from Cecil B. DeMille. Legendary Ringling Bros. and Barnum & Bailey Circus performers in The Greatest Show on Earth included Emmett Kelly and Lou Jacobs (clowns), with John Ringling North playing himself as the circus owner (which he was in real life at that time). The Greatest Show on Earth movie inspired a TV series of the same name from 1963-1964, starring Jack Palance. In January 2017, Ringling Bros. and Barnum & Bailey Circus announced the end of their circus, after 146 years as "The Greatest Show on Earth". Curly Howard of The Three Stooges died on January 18, 1952. Nee Jerome Lester Horwitz, Curly Howard was the youngest of the 3 Howard brothers - Moe, Shemp, and Curly. 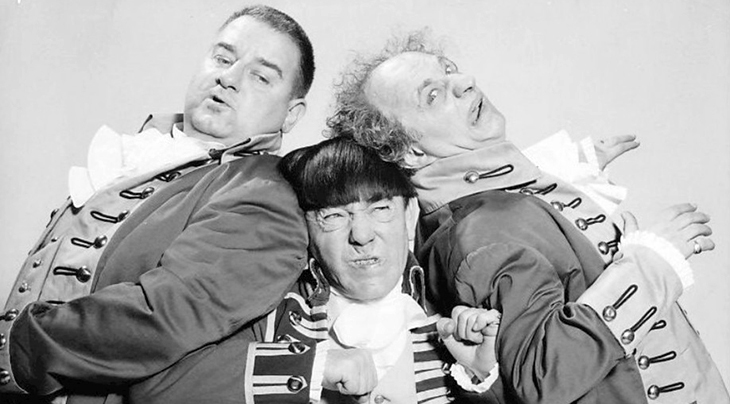 They all became comedians and were a brother act in the movies as the Three Stooges; Shemp left to go solo and was replaced by Larry Fine; he returned later on. Aside from the physical comedy the Three Stooges all displayed, Curly Howard became known for his high voice, coining the phrase "soitenly", laughing "Nyuk, nyuk, nyuk" and barking like a dog. A first marriage to Julia Rosenthal (1930-1931) ended in annullment. Curly Howard married for the second time in June 1937 to Elaine Ackerman; their daughter Marilyn Howard was born in 1938, before they divorced in 1940. His brother Moe Howard looked out for Curly professionally and financially for most of his life, and even saved his life by getting him to the hospital when Curly accidentally shot himself in the ankle at the age of 12. Curly hid the resulting limp with an exaggerated gait onscreen. Curly Howard acquired over 120 film credits, from movies released between 1933-1947. In 1944 Curly Howard filmed several Three Stooges movies, but was not in good health; it's been surmised that he suffered strokes during the filming. In January 1945 he was diagnosed with obesity, extreme hypertension, and a retinal hemorrhage. Despite ill health, Curly Howard married Marion Buxbaum, his third wife, in 1945. His marriage to Marion was not a happy one, and his health continued to deteriorate, to the point he had difficulty remembering simple dialogue. In May 1946 Curly suffered a severe stroke that ended his show business career; his brother Shemp Howard returned to the Three Stooges act in his place. Curly and Marion divorced in 1946, and the following year he met Valerie Newman. Valerie and Curly Howard married in July 1947, and she gave birth to their daughter Janie Howard in 1948. Later that year he had another severe stroke that left him partially paralyzed. Curly Howard was 48 years old when he died of a final cerebral hemorrhage in January 1952. In January 1952 the song Cry by Johnnie Ray and The Four Lads went to the top of the Billboard charts, and stayed there until mid-March 1952. Below, Johnnie Ray sings Cry on TV in 1957, in a vintage video of his first performance on The Big Record, that includes an Oldsmobile ad snippet at the beginning. American singer-songwriter and pianist Johnnie Ray was born Jan. 10, 1927 and has been credited as the father of rock and roll. An accident as a young teenager resulted in him becoming deaf in his left ear; he would later perform with a hearing aid. In 1952 the song Cry launched Johnnie Ray's career and he was frequently at the top of the charts during the 1950's. Botched ear surgery in 1958 left him almost completely deaf in both ears, but hearing aids were helpful. Despite twice being arrested for soliciting undercover police officers (1951 and 1959), Johnnie Ray was married to Marilyn Morrison in May 1952; they were divorced in 1954 after being separated since 1953. Ray recovered from tuberculosis in 1960, but his career was on the way down. Johnnie Ray was a heavy drinker and died of liver failure on February 24, 1990 at the age of 63.